Computational Environmental and Energy Design - Workshop on the integration of parametric and generative design methodologies with environmental and energy simulations for architecture and planning. The workshop is addressed to students of architecture and civil engineering faculties at master level. The selected students will have full scholarship that will include travel, board and lodging in Tallinn for 10 days (arrival on Sunday 03.07.2016 departure on Wednesday 13.07.2016). The workshop is funded by the NORDPLUS programme of the Nordic Council of Ministers (NCM) - Higher Education objective (project title: Environmental Computational Design and Planning Workshop - project ID: NPHE-2015/10036). The use of digital and computational design tools is always more and more important for the activity of design and research for architects and engineers. It permits to integrate environmental and energy aspects from the very early stages of the design and planning process. At the same time it allows to design in shorter time and with less resources more performative and efficient buildings through the integration of parametric and generative technologies with environmental and energy simulation tools giving the possibility to students and professionals to raise the bar of the energy efficiency of their design and planning. - Using parametric and generative software the students will learn how to integrate efficiently environmental and energy topics in building design and planning processes. - The workshop will develop the student’s awareness and skills about integrating solar design, energy analysis and daylight simulations into building design and planning from the early stages of design. - The students will learn how to use the different software and maximize the opportunity to realize environment friendly and energy efficient building design and planning. - Lectures about the theoretical framework at the base of the workshop. The lectures topic will include solar geometries and daylighting, architectural design passive strategies, energy efficiency for new and existing buildings, indoor climate, building façade design. - How-to lessons to integrate solar design, daylighting and energy tools with computational design techniques and methodologies, and application of the tools and methodologies to examples of design and planning projects. No prerequisites are necessary. It is an advantage a basic proficiency with CAD and BIM software, parametric design tools, environmental analysis and energy performance simulation software. Approximately two months before the workshop will be launched a website with information and tutorials for the participants to get a useful basic knowledge before starting the workshop. In the workshop there will be 20 students from four different countries. Three from Sweden, Latvia and Lithuania and eleven from Estonia. To request to participate in the workshop the students will have to write an email to Francesco De Luca at francesco.deluca@ttu.ee with motivation letter and a brief CV with indication of design experience, CAD, BIM and performance analysis software proficiency. The selection will be done on the base of the following: date of request by email, motivation letter, CV. At the end of the workshop the students will present the work of study case design developed singularly or in small groups to show the process used to integrate computational methodologies with environmental and energy design tools and the outcomes. The workshop will grant 4 ECTS. The deadline for the request of registration is 15.06.2016. - Lecture - Solar geometries and daylighting – Prof. Hendrik Voll. - Lecture - Architectural passive strategies and computational design – Dr. Francesco De Luca. - Workshop - Introduction to computational design, BIM and environmental design. - Workshop - Building modeling and environmental analysis using solar tools (sunpath, shadows studies, solar access, right to light) – Software Ecotect Analysis. - Workshop - 3D modeling for computational design – Software Rhinoceros. - Workshop - Computational design (parameters and components, math operators, functions) – Software Grasshopper. - Workshop - Computational design (domains, vectors, geometries creations and transformations) – Software Grasshopper. - Workshop - Solar analysis (weather analysis, sunlight hour calculation, solar radiation, solar envelope and solar fan) - Software Ladybug/Grasshopper. - Workshop - Computational design (data management, conditional statements, data outputs) - Software Grasshopper. - Workshop - Daylight analysis (sky types, image and grid based simulations, daylight factor, illuminance) – Software Radiance in Honebee/Grasshopper. - Workshop – Dynamic daylight analysis (daylight autonomy metrics), electric light integration – Software Radiance and Daysim in Honeybee/Grasshopper. - Workshop - study case. - Workshop – Energy model construction (zones, geometry settings, constructions and material properties) – Software EnergyPlus in Honeybee/Grasshopper. - Workshop – Study case. 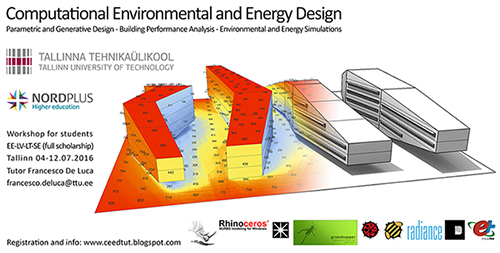 - Workshop - Energy model set-up and simulations (loads, schedules and set-points, simulations results analysis, photovoltaics integration) – Software EnergyPlus in Honeybee/Grasshopper. - Lecture: Buildings envelope design for energy efficiency and storage – Prof. Anatolijs Borodinecs. Tallinn University of Technology ©. Awesome Inc. theme. Powered by Blogger.